Feb. 25 (Bloomberg) -- Crude oil extended its gains, trading above $80 a barrel, after rising as Federal Reserve Chairman Ben S. Bernanke said the U.S. economy is in a “nascent” recovery. Oil climbed 1.5 percent yesterday as Bernanke told the House Financial Services Committee private-sector demand growth for goods and services will fuel the rebound. The Energy Department reported U.S. oil supplies gained 3.03 million barrels last week to 337.5 million, the highest since November. Crude oil for April delivery rose 32 cents, or 0.4 percent, to $80.32 a barrel in electronic trading on the New York Mercantile Exchange at 10:02 a.m. Sydney time. Yesterday, the contract rose $1.14 to settle at $80. U.S. fuel consumption rose 1.3 percent from a year earlier to 19.1 million barrels a day in the four weeks ended Feb. 19, the Energy Department said. Supplies of gasoline dropped 895,000 barrels. They were forecast to increase 600,000 barrels in a Bloomberg News survey of analysts. Crude stockpiles were forecast to increase by 1.9 million barrels, according to the survey. Distillates, including heating oil and diesel fuel, fell 591,000 barrels to 152.7 million, the department said. They were estimated to drop 1.5 million barrels in the survey. Refinery utilization jumped 1.42 percentage points to 81.2 percent, the highest level since the week ended Jan. 8. Operations were forecast to gain 0.2 percent. Brent crude for April settlement increased 84 cents, or 1.1 percent, to $78.09 a barrel on the ICE Futures Europe exchange in London yesterday. Feb. 25 (Bloomberg) -- The yen weakened as a rebound in stocks and prospects that economic stimulus measures will stay in place curbed demand for Japan’s currency as a refuge. The yen fell against all of its 16 major counterparts as local shares followed a equities rally in the U.S. The Australian and New Zealand dollars rose for a third day this week as Federal Reserve Chairman Ben S. Bernanke said the U.S. needs low interest rates to preserve a “nascent” recovery, safeguarding the South Pacific nations’ yield advantage. The yen declined to 90.25 to the dollar as of 9:25 a.m. in Tokyo from 90.15 in New York yesterday. Japan’s currency traded at 122.09 per euro from 122.03. New Zealand’s dollar climbed 0.2 percent against the U.S. currency, while Australia’s strengthened 0.1 percent. The U.S. currency traded at $1.3533 versus the euro from $1.3538 yesterday. The dollar has risen 2.5 percent versus the euro this month, heading for a third monthly gain, its longest stretch since November 2008. The Nikkei 225 Stock Average advanced 0.4 percent after the Standard & Poor’s 500 Index rose 1 percent. Bernanke said low interest rates are needed to encourage demand by consumers and businesses once federal stimulus expires. Interest-rate futures on the Chicago Board of Trade yesterday showed a 51.5 percent chance U.S. policy makers would raise the target lending rate by at least a quarter-percentage point to 0.5 percent by November. That was down from 57.5 percent the day before. CPO 3rd month May futures contract traded RM45 lower to close at RM2590 levels as compare to previous trading sessions with a total of 7,177 lots traded in the market. CPO price plunge lower as crude oil and soybean oil overnight and electronic trading were traded weak despite short fall at US inventory as announce in yahoo finance news. FKLI Feb Futures contract traded unchanged to close at 1270 levels as compare to previous trading session to with a total of 8,596 lots traded in the market. FKLI opened lower as Dow Jones overnight was settled 100 point lower as compare previous settlement but FKLI manage to recover during trading sessions as regional indices were recovered due to some profit taking activity. 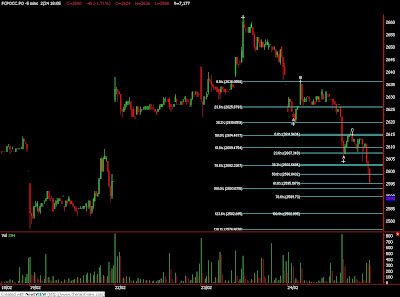 FKLI price tested 38.1% and 23.6% Fibonacci resistances level at 1272.5 regions before start to consolidate around 1269 and 1272 regions. Technically, FKLI still seen indecisive on the short term trend as FKLI has yet to reach objective price at 1288.5 regions neither attempt to penetrate support levels at 1262 and 1247 regions during trading sessions. However, FKLI still riding on correction phase on the medium term provided resistance levels at 1288.5 and 1295.5 were not violated in the coming trading sessions. Failure to hold above support level at 1262 shall indicate wave C count begin for further correction. Feb. 24 (Bloomberg) -- Crude oil traded below $80 a barrel in New York after declining as confidence among U.S. consumers dropped in February to the lowest level in 10 months, a signal that energy demand may be slow to increase. Oil fell yesterday from a five-week high as the Conference Board’s confidence index weakened to 46, below the lowest forecast in a Bloomberg News survey of economists, from a revised 56.5 in January. German business confidence also declined for the first time in 11 months. Crude oil for April delivery was at $79.03 a barrel, up 17 cents, in electronic trading on the New York Mercantile Exchange at 8:24 a.m. Singapore time. Yesterday, the contract dropped $1.45 to $78.86, the biggest decline since Feb. 5. The report by the Conference Board, a New York-based private research group, also indicated that more people believe jobs are difficult to obtain, a sign spending may be slow to gain traction as the economy recovers. Economists forecast the confidence index would decrease to 55 from a previously reported 55.9 January reading, according to the median of 68 projections in the Bloomberg survey. Estimates ranged from 50.9 to 59. The American Petroleum Institute reported yesterday that U.S. crude-oil stockpiles decreased 3.14 million barrels to 334.4 million last week. Gasoline inventories rose 1.74 million barrels, the API said. The Energy Department is due to release its inventory figures in Washington today. Crude supplies probably increased 1.9 million barrels in the week ended Feb. 19, from 334.5 million, according to the median of responses in a Bloomberg News survey of analysts. It would be a fourth consecutive gain. The Ifo institute in Munich reported yesterday that its business climate index, based on a survey of 7,000 executives, fell to 95.2 in February from 95.8 in January. Economists expected a gain to 96.1, according to the median of 37 forecasts in a Bloomberg News survey. Brent crude oil for April settlement declined $1.36, or 1.7 percent, to $77.25 a barrel on the ICE Futures Europe exchange in London yesterday. Feb. 24 (Bloomberg) -- The yen traded near a two-week high against the euro as signs the global economic recovery will slow boosted demand for Japan’s currency as a refuge. The yen may extend gains versus higher-yielding currencies as Asian stocks followed a decline in U.S. equities and before a report forecast to show American companies expanded at a slower pace. The dollar traded near a one-week low against the yen on prospects Federal Reserve Chairman Ben S. Bernanke will tell Congress that last week’s increase in the discount rate isn’t a prelude to higher benchmark borrowing costs. The yen traded at 121.78 per euro as of 9:29 a.m. in Tokyo from 121.86 in New York yesterday, when it touched 121.58, the strongest since Feb. 12. The dollar fetched 90.16 yen from 90.22 yen after reaching 89.92 yen yesterday, the lowest since Feb. 16. The euro, which sank 0.7 percent yesterday, was little changed at $1.3506. It declined to $1.3444 on Feb. 19, the lowest since May 18. The Nikkei 225 Stock Average fell 1.7 percent, and the MSCI Asia Pacific Index of regional shares dropped 1.1 percent. The MSCI World Index dropped 1 percent yesterday. The Institute for Supply Management-Chicago Inc. is forecast to report on Feb. 26 that its business barometer fell to 59.7 this month from 61.5 in January, according to the median estimate of economists in a Bloomberg News survey. Readings greater than 50 signal expansion. The yen rose yesterday against all of the 16 most-traded currencies tracked by Bloomberg as a report showed U.S. consumer confidence fell to a 10-month low. The Conference Board’s confidence index declined to 46, below the lowest forecast in a Bloomberg News survey of economists, from a revised 56.5 in January, a report from the New York-based private research group showed yesterday. The yen rose 1.9 percent, the biggest gain since Feb. 4, to 389.95 yesterday, according to the Bloomberg Correlation- Weighted Currency Index. The index calculates the value of the yen against a basket of currencies from the Group of 10 based on variances in exchange rates. Bernanke is set to deliver his semiannual report on the economy today and tomorrow to Congress a week after the Fed decided to raise the discount rate charged to banks for direct loans. “The Fed’s action last week won’t lead to immediate rate increases,” said Tetsuya Inoue, chief researcher in Tokyo for financial markets and technology studies at Nomura Research Institute. “The employment situation limits the possibility for rate hikes,” a negative factor for the dollar. Fed Bank of St. Louis President James Bullard said in Richmond, Virginia that the central bank may hold off on raising interest rates through 2010. The euro traded near a nine-month low against the dollar on speculation that credit ratings for Greek banks will be reduced further. Greece’s four biggest banks, including National Bank of Greece SA and EFG Eurobank Ergasias SA, had their credit grades lowered yesterday at Fitch Ratings, which said the nation’s economic crisis will hurt asset quality. Fitch said it had a “negative outlook” on the banks that may result in more action. CPO 3rd month May futures contract traded marginally RM4 higher to close at RM2635 levels as compare to previous trading sessions with a total of 9,708 lots traded in the market. CPO price plunge lower after manage to reach highest at RM2662 regions due to some profit taking activity during trading sessions despite soybean oil and crude oil were traded mix during trading sessions. CPO price reach projected figure at RM2655 regions at 78.6% Fibonacci resistance level while other projected Fibonacci ratio also met at RM2660 regions. Technically, CPO price seems topped around RM2660 regions provided next resistance levels at RM2660 and RM2726 regions were not violated in the coming trading sessions while we anticipate CPO price would traded lower riding on wave C count in the hourly chart. 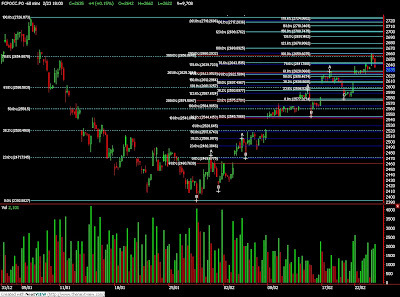 Next nearest support levels were seen at RM2622 and RM2582 regions. 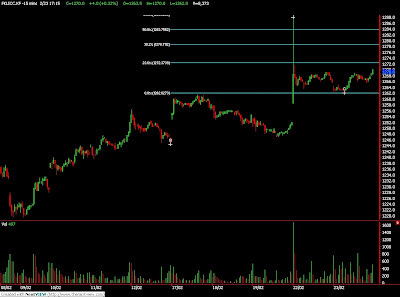 FKLI Feb Futures contract traded 4 points higher to close at 1270 levels as compare to previous trading session to with a total of 8,373 lots traded in the market. FKLI opened lower as regional indices were traded weak in the early session but manage to recover in the 2nd trading sessions as Hang Seng indices were traded higher. FKLI price manage to reach 61.8% Fibonacci support levels at 1262.5 regions after spike up at 1288 regions in the previous trading sessions. Technically, FKLI seems completed wave 4 count in short term trading where expected resistance seen at 1278 and 1288.5; both are 38.1% and 61.8% Fibonacci resistance levels, to complete wave B in the hourly price chart. However, FKLI still view as riding on correction phase in the medium term provided resistance levels were not violated while support levels at 1262 and 1247 were not violated in the coming trading sessions. Feb. 23 (Bloomberg) -- The dollar fell against the euro on prospects the Federal Reserve will hold its target interest rate near zero to sustain a recovery in the world’s biggest economy. The U.S. currency dropped against the yen for a third day on speculation Fed Chairman Ben S. Bernanke will tell Congress tomorrow that last week’s increase in the discount rate isn’t intended to drive up borrowing costs. The euro was near an 11- month low versus the Swiss franc as the International Monetary Fund sent a staff member to Athens to provide assistance, adding to concern over the nation’s debt crisis. The yen rose against Brazil’s real and the South Korean won as Asian stocks fell. The dollar fell to $1.3620 per euro at 1:17 p.m. in Tokyo from $1.3596 in New York yesterday. It touched $1.3444 on Feb. 19, the highest since May 18. The greenback fetched 91.03 yen from 91.14 yen. The yen was at 124.00 per euro from 123.92. The U.S. currency fell against 13 of its 16 major counterparts after Federal Reserve Bank of San Francisco President Janet Yellen said the U.S. economy still needs low interest rates to gain strength. Japan’s currency strengthened 0.1 percent against the real and 0.1 percent versus the won as the Nikkei 225 Stock Average fell 0.4 percent. The real’s value against the yen had a correlation of 0.90 with the Nikkei 225 in the past year. A reading of 1 would mean the two moved in lockstep. The yen typically strengthens in times of financial turmoil as Japan’s trade surplus makes the currency attractive because the nation doesn’t have to rely on overseas lenders. Losses in the dollar were limited as economists surveyed by Bloomberg said sales of new U.S. homes rose 3.1 percent in January after dropping 7.6 percent in December. The Commerce Department reports the data tomorrow. Bookings for durable goods climbed 1.5 percent last month, another Bloomberg survey showed before the Commerce Department’s report on Feb. 25. “The dollar remains firm as good economic reports put upward pressure on yields, especially long-term ones,” said Minoru Shioiri, chief manager of foreign-exchange trading at Mitsubishi UFJ Securities Co. in Tokyo. Feb. 23 (Bloomberg) -- Oil declined for the first time in six days, dropping below $80 a barrel, before a report that is expected to show an increase in crude supplies in the U.S., the world’s biggest energy consumer. Oil dropped as much as 0.6 percent as analysts forecast that stockpiles probably rose 1.9 million barrels last week from 334.5 million, according to the median of seven estimates in a Bloomberg News survey. That would be the highest inventory level since November. Gasoline supplies probably also increased, analysts said. Crude oil for April delivery dropped as much as 45 cents, or 0.6 percent, to $79.86 a barrel in electronic trading on the New York Mercantile Exchange, and was at $80.01 at 11:07 a.m. Sydney time. Yesterday, the March contract rose 35 cents, or 0.4 percent, to settle at $80.16. 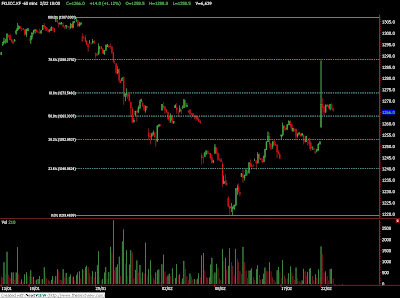 The contract expired at the close of floor trading. Gasoline supplies probably gained 1 million barrels from 232.1 million, a Bloomberg survey showed. Six of the analysts anticipated an increase, two predicted a decline and one said inventories were unchanged. Brent crude for April settlement gained 42 cents, or 0.5 percent, to $78.61 a barrel on the London-based ICE Futures Europe exchange yesterday, the highest price since Jan. 12. Feb. 23 (Bloomberg) -- The yen fell against higher-yielding currencies on prospects Japanese investment trusts will send funds overseas this week. The dollar dropped against 13 of its 16 major counterparts after U.S. shares declined and Federal Reserve Bank of San Francisco President Janet Yellen said the U.S. economy still needs low interest rates to gain strength. The euro traded near a nine-month low against the dollar as speculation that Greece’s fiscal woes will worsen reduced demand for the 16-nation region’s assets. The yen fell to 124.21 per euro as of 9:33 a.m. in Tokyo from 123.92 yesterday in New York. The Japanese currency weakened to 91.26 to the dollar from 91.14. Europe’s single currency was at $1.3609 from $1.3596. It touched $1.3444 on Feb. 19, the lowest since May 18. The yen fell against 15 of its 16 most-traded counterparts on speculation Japanese investors are preparing to buy overseas assets. Finance companies are seeking to raise at least 3.8 trillion yen ($41.7 billion) for so-called Toshin mutual funds focused on higher-yielding securities this week, according to Bloomberg data. The benchmark interest rate of 0.1 percent in Japan compares with 3.75 percent in Australia and 2.5 percent in New Zealand, attracting investors to the South Pacific nations’ assets. The risk in such trades is that currency market moves will erase profits. Demand for the dollar waned as Yellen said the U.S. economy will operate below potential this year and next. Fed Chairman Ben S. Bernanke may tell Congress tomorrow that last week’s increase in the discount rate isn’t intended to drive up borrowing costs. Amadeu Altafaj, a spokesman for the European Union, told reporters in Brussels yesterday there was no plan to bail out Greece. A rescue package is “a speculative scenario at this point in time,” he said. European Central Bank Executive Board member Lorenzo Bini Smaghi said he opposes International Monetary Fund assistance for Greece, saying that if Europe doesn’t fix the problem by itself, it won’t be able to prevent the next one. He spoke yesterday in an interview on Italian television channel La Sette. CPO 3rd month May futures contract traded RM35 higher to close at RM2631 levels as compare to previous trading sessions with a total of 6,557 lots traded in the market. CPO price traded higher as soybean oil and crude oil were traded higher during overnight and electronic trading during trading sessions to stay on par as edible oil and bio diesel product. 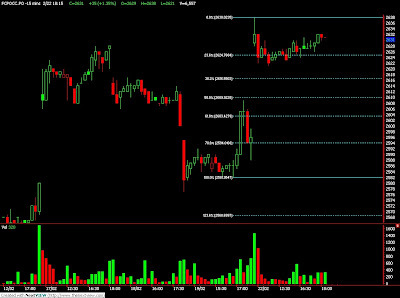 CPO price open higher but traded sideways towards upside to reach resistance levels at 61.8% Fibonacci resistance levels at RM2631 after meet objective at RM2638 at 378.6% Fibonacci objective levels. Technically, CPO price seems performing minor correction phase where we anticipate support levels seen at RM2610 and RM2582 levels. However, CPO price still view riding on rebound wave where next objective price seen at RM2655 regions while next nearest resistance levels seen at RM2726 regions. FKLI Feb Futures contract traded 14 points higher to close at 1266 levels as compare to previous trading session to with a total of 6,639 lots traded in the market. FKLI opened higher and triggered higher to 1288 levels due to some overnight stop limit order as price attempt to trade higher as regional indices were traded higher during trading sessions. 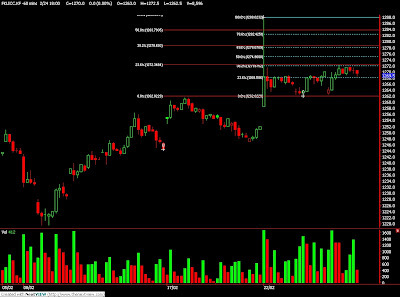 FKLI spike up highest at 1288 levels, 78.6% Fibonacci resistance levels, after previous resistance levels at 1261.5 fails to overcome the buying activities during morning sessions. Technically, FKLI manage to reach 1288 resistance levels on wave C count despite we anticipate resistance levels at 1280 regions on wave 4 count basis. However, resistance levels at 1280 view as vital resistance levels in case FKLI still trading on wave 4 counts while 1288 seen at false pricing. Medium term still suggest FKLI still trading on correction phase provided resistance levels at 1288 and 1295.5 were not violated while support levels were seen at 1247 and 1263 regions. Feb. 19 (Bloomberg) -- Soybeans fell for a third straight day as rain enhanced yield potential for South American crops, curbing sales of supplies from the U.S., the biggest exporter. Export sales slumped 35 percent to 203,587 metric tons in the week ended Feb. 11, the smallest amount since the start of the marketing year on Sept. 1, the U.S. Department of Agriculture said today. The total included 279,000 tons in earlier sales that were canceled. Soybean futures for May delivery fell 3 cents, or 0.3 percent, to $9.545 a bushel on the Chicago Board of Trade. The most-active futures rose less than 0.1 percent this week after surging 4.4 percent a week ago, the most since November. Growers in Brazil and Argentina, the two biggest exporters after the U.S., have begun harvesting what the USDA has said will be a record soybean crop, partly because of rain in the past two months. Production will be a combined 119 million metric tons this year, up 34 percent from a year earlier, the USDA said last week. Soybeans are the biggest U.S. crop after corn, valued at a record $31.8 billion last year, USDA figures show. Feb. 22 (Bloomberg) -- Crude oil traded near a five-week high on speculation energy demand will increase as the global economy recovers from its worst recession since World War II. Global consumption may increase by as much as 1.4 million barrels a day in the second half, Iran’s OPEC governor Mohammad Ali Khatibi said in an interview on the Shana Web site yesterday. Prices pared early gains as the dollar traded little changed after posting its sixth straight weekly increase against the euro, the longest streak since 2000. Crude oil for March delivery rose as much as 30 cents, or 0.4 percent, to $80.11 a barrel in after-hours electronic trading on the New York Mercantile Exchange. It was at $80.06 at 7:55 a.m. in Singapore. The contract, which expires today, rose 0.9 percent to $79.81 on Feb. 19, the highest settlement since Jan. 12. The more actively traded April contract rose 31 cents to $80.37 today. Oil prices climbed 7.7 percent last week, the biggest gain since October, as U.S. refiners lifted operating rates for a second week and the Federal Reserve increased its discount rate for the first time in three years amid signs of recovery in the nation’s economy. A report today in the U.S., the world’s biggest oil consumer, will probably show economic activity jumped to its highest in six months in January, according to a Bloomberg News survey of economists. Oil prices may “creep” toward $84 in coming weeks if there is sufficient economic data to support the more positive sentiment in the market, CWA’s Hassall said. Still, gains beyond that may be limited, he said. While developing Asian nations will underpin demand, Europe’s prospects aren’t looking strong, and that will in-turn help support the dollar, he said. Oil fell as low as $69.50 on Feb. 5 as rising job losses in the U.S. and debt concerns in Europe pulled U.S. stock prices to a three-month low and prompted selling of a broad range of commodities. Hedge-fund managers and other large speculators last week increased bets on rising oil prices for the first time since mid-January, according to U.S. Commodity Futures Trading Commission data. Speculative net-long positions, the difference between orders to buy and sell the commodity, jumped 63 percent to 68,436 contracts on the New York Mercantile Exchange in the week ended Feb. 16, the commission said in its weekly report. It was the first increase since the week ended Jan. 12. Brent crude for April delivery rose 25 cents, or 0.3 percent, to $78.44 a barrel on the London-based ICE Futures Europe exchange. It climbed 0.5 percent to $78.19 on Feb. 19, the highest settlement price since Jan. 13. Strikes at Total SA refineries and depots in France also helped push product prices higher. Plants are being prepared for the shutdown of crude processing as the strike enters its seventh day, the company said yesterday. Feb. 22 (Bloomberg) -- The yen declined to a two-week low against the euro as rising Asian stocks damped demand for the Japanese currency as a refuge. The yen dropped against all of its 16 major counterparts as the Nikkei 225 Stock Average jumped 2.3 percent after the Standard & Poor’s 500 Index rose 0.2 percent on Feb. 19. The dollar dropped against higher-yielding currencies on prospects the lack of U.S. job growth will keep Fed Chairman Ben S. Bernanke from raising the key rate after last week increasing the cost of direct loans to banks. The yen dropped to 125.19 per euro as of 9:13 a.m. in Tokyo from 124.58 in New York on Feb. 19, after touching 125.24, the lowest since Feb. 4. The yen fell to 91.87 per dollar from 91.52. The greenback was at $1.3630 per euro from $1.3613 on Feb. 19, when it touched $1.3444, the highest since May 18.